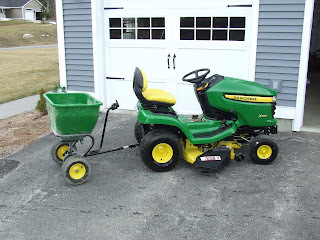 Last week I purchased the John Deere 3.5 cu ft tow-behind broadcast spreader. I finally assembled it and put it to use. First off let me say that John Deere has got to be one of the last companies selling products in this country with extremely well written directions and parts. All of the small parts (bolts, clips, nuts, etc.) are packed in a shrink wrap package that is labeled to coincide with each step in the assembly directions. What a novel concept…..great directions that include well written English sentences, great diagrams and a unique label/packaging idea. More companies should take a lesson from these folks and put some time into the assembly directions. Anyway, it took me about 35 minutes or so to assemble the spreader (that even includes my 3 yr old tagging along with me). As you can see in the photo there is a control level located just behind the mower seat so you can easily reach back and adjust the flow or completely shut off the spreader. The one bad feature if you want to call it bad is you can’t reach back to adjust the slow spread from left to right. If you want to shut off flow to one side you need to stop and go to the back of the spreader to make that adjustment. The flow lever allows you to control the flow from 1 to 10. However, at a setting of 3 or lower I wasn’t able to get any flow. That might actually be due to the product and not the equipment. Now for the good stuff. I was able to put down over 2,000 lbs of palletized lime in just over an hour. If I had used my walk behind spreader it would have taken me longer than I care to think about. There’s no doubt that using this for fertilizing and spreading lime was well worth the $220. I’m using this for a lawn that is about 1.2 acres in size so it makes a huge difference. I’d say any lawn that’s 3/4 to 1 or more acres is worth it. I just read your articles on the John Deere aerator and seed spreaders. I live on 5 acres outside of Sydney and own a Husqvarna ride-on. I have been seriously thinking of purchasing a plug aerator and trailer sprayer for our property (I’ve also thought about getting a seed spreader, but for the time being I can do this by hand). In your opinion, how has the aerator faired so far ? Has it been worth the expense and has it made a difference to the health of your lawn ? Thanks mate, hope to back from you soon. PS: Your lawn looks awesome. @ Barry – The aerator has been great. It works very well and has certainly improved our lawn. I definitely recommend it. Hi, we have the same jd spreader and can’t find anywhere the flow setting for pelletized lime. What did you set yours at for the lime? Thanks!